So, I recently partook in Hacktoberfest which is an event that helps to support thousands of different Open Source projects. Usually, I tend to get caught up in other projects or can’t find the time or make up a hundred other excuses for not taking part. So, through my travels, one thing seemed to be prevalent across multiple high-quality projects and that was they had a solid continuous integration, and sometimes continuous deployment pipeline that is triggered whenever somebody makes changes to their codebase. If you haven’t built a highly used package before, the benefits of a CI/CD pipeline may not be immediately obvious to you. If you have built a highly-used package then feel free to move on to the next section of this article. Building a solid CI/CD pipeline around your package can help to infinitely improve the packages useability and if you are going to build an incredibly successful open source package, this is something you seriously have to consider in order to ensure you don’t piss off users by deploying breaking changes or broken code. CI, or Continuous Integration is a practice that helps you to automatically test and merge any changes to your codebase in such a way that new version release day is easy. CD, or Continuous Deployment is a practice that ensures that you can deploy your application with any new changes in a quick and sustainable way. We won’t be worrying about the CD section of the pipeline in this article as that could have an infinite number of deployment platforms and cataloging these all would be an ongoing slog. Now, the process for making any changes to our Go package will be slightly more complex than your standard git commit and git push origin master. We’ll have to lock down our project so that we can’t directly commit to our master branch. Why you may ask? well, so that we can enforce every change to our package to go through the pipeline we’ll be fleshing out later on in this article. 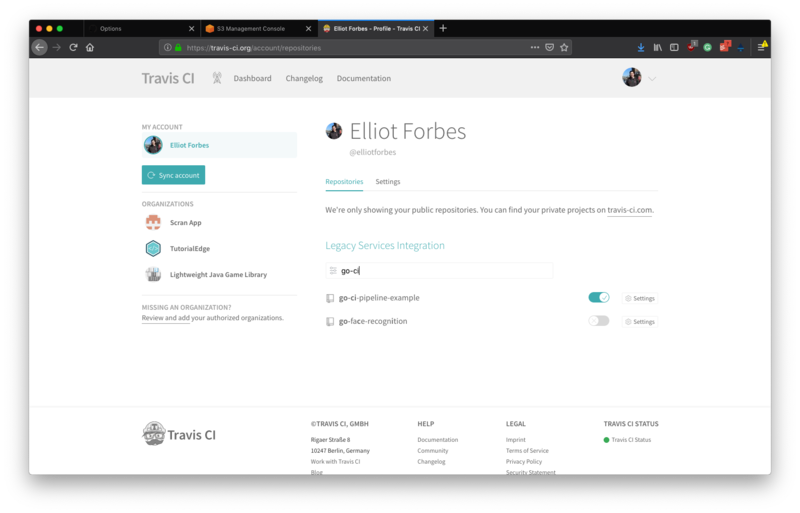 Now, with everything on the travis side setup, we can move on to triggering our pipeline and adding more functionality to it. Right now it doesn’t do an awful lot, so let’s change that! And this will automatically create a new branch, new-feature-branch and checkout that newly created branch. You’ll then be able to make your changes to your code and commit them to your newly created branch. When you are finally happy with your changes and you want to merge them into master to make them available to the rest of the world, you then open up your project in Github and you create a new Pull Request from your new-feature-branch. Now, this is where the interesting stuff happens. When you create this new pull request, Travis-CI will automatically pick this up and kick off your pipeline for you. Within your newly created Pull Request, you should see that this has been kicked off and it’ll then let you know if the code you wish to merge is fit to merge based off our previously defined tests and formatting. Now that we’ve got our tests automatically running on a code change, it’s time to add automatic formatting using gofmt. Let’s update our .travis.yml file to include a gofmt step in our script. We’ll do this prior to running our test suite as any failures at the format stage make the tests passing or failing irrelevant. echo "Go code is not formatted:"
If you are unfamiliar with scripting, this essentially goes away and runs the gofmt command with the -d flag in the current directory. If this fails, it will throw exit code 1 and the build will ultimately fail. Finally, should all of our tests and formatting checks pass, we need to set up some reviewers for our project that will be able to manually verify that we aren’t adding malicious code or extending the project in a way that is unsuitable. You’ll also want to check the Require status cheks to pass before merging option to ensure that the pipeline we have put in place is actively enforced for every pull request. 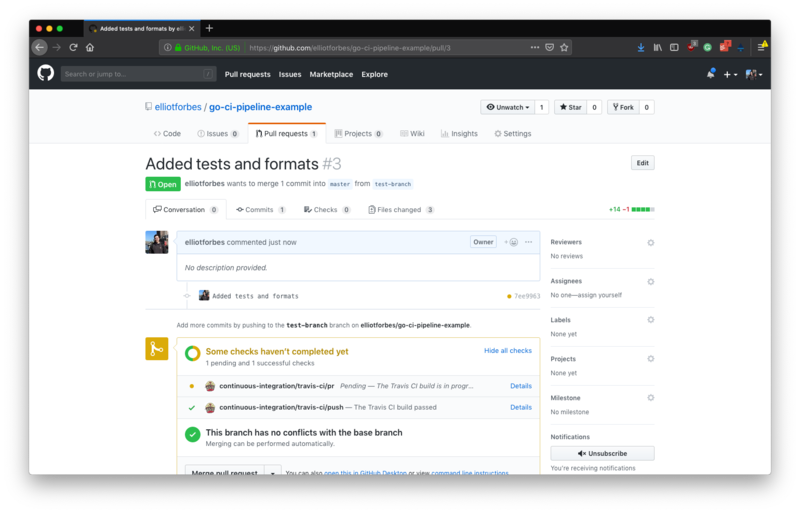 After this is done, we’ve successfully pulled together a really simple and effective continuous integration pipeline for our Go project. Now that everything is in place, it is time to test it all works. Create a new branch on your project and open a new pull request to master from your branch. 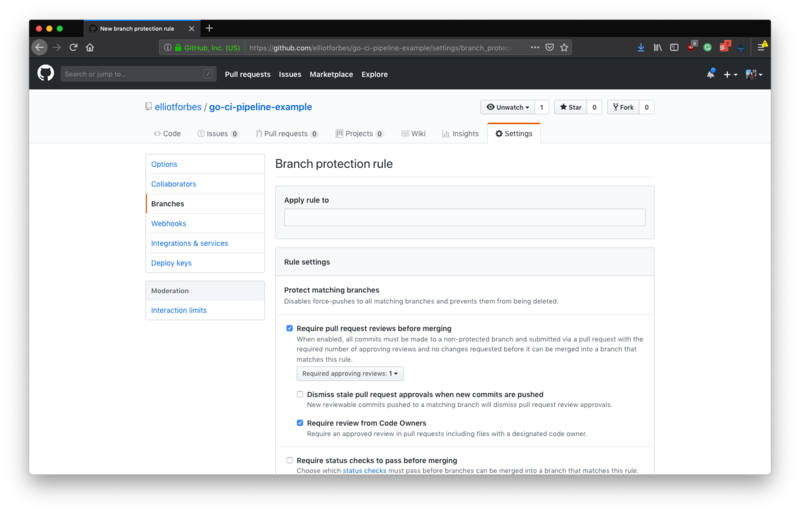 If you have set up your branch rules correctly, any outsiders attempting to submit a PR into your project will have to be reviewed and approved over and above passing the travis pipeline before they can get their changes into master. Now, I’ve put all of this together for you in a handy project repo which can be found here: elliotforbes/go-ci-pipeline-example. Hopefully, this helps you in some way and if it does, then feel free to let me know in the comments section down below! If you have any feedback or any further questions, I’d also love to hear them so please do get in touch either via the comments or via my twitter: @Elliot_f.